The Greenback may have been off to a weak start in January, as extremely cold weather conditions weighed on hiring and growth during the previous quarter, but price action warmed up soon enough as Fed taper talks dominated the airwaves. Former Fed Chairperson Ben Bernanke decided to carry on with the taper in January and new Fed head Janet Yellen simply picked up where he left off. With that, forex traders began counting down the days before the Fed completely withdraws monetary stimulus, projecting the end of easing by October 2014. Even though the U.S. economy hit a few road bumps throughout the year, the gradual monthly reduction asset purchases was enough to keep the U.S. currency supported. It’s no secret that the U.S. dollar usually takes advantage of risk-off market environments, as its safe-haven status serves as a refuge for traders during times of uncertainty. Geopolitical risks stemming from the conflict in Ukraine and Gaza weighed on risk appetite mid-year, resulting to unprecedented levels of fear and volatility in the markets. While the troubles seemed to subside in the following months, any news reports suggesting that tensions could flare again were enough to spark risk aversion and a flight to safety every now and then. In fact, economic sanctions doled out on Russia by the European Union and the U.S. appeared to have a lasting drag on risk-taking. Save for a few glitches here and there, the U.S. labor market was able to show remarkable progress in 2014. Heck the jobless rate was able to drop from 6.6% all the way down to 5.8% this year! That’s its six-year low! Much of the developments were made during the latter half of the year, as hiring gains averaged at close to 250,000 a month since June. Weak wage growth remained a concern though, with feeble gains in average hourly earnings throughout the year. Other labor market indicators showed slow but steady improvements, as the participation rate stabilized around 62.8% and the employment-to-population ratio marked its largest gain in nearly a decade. So far, the jobs figures have exceeded Fed expectations, further supporting tightening prospects. A potential slowdown in China, the looming euro zone recession, and global deflation woes… All these weighed in favor of the U.S. dollar sometime during the third quarter of the year, as the “fear trade” dawned upon the markets. Right around that time, it was rumored that major central banks were silently engaging in currency wars in order to ward off deflationary threats. While the likes of the RBNZ and SNB opted for currency jawboning and the ECB and BOJ implemented actual easing, the Fed seemed unnerved and confident in Uncle Sam’s economic prospects. As the Fed taper eventually resulted to an end of the stimulus program in October, market participants focused their attention on when the U.S. central bank might start hiking interest rates. Even though Yellen and her gang of policymakers have repeatedly mentioned that rates will stay low for a “considerable time” after easing ends, forex traders couldn’t help but speculate that tightening might start in mid-2015. In their last FOMC statement for the year, policymakers decided to add some remarks on being patient about considering gradual monetary policy adjustments, giving the Greenback an extra boost. Of course Yellen emphasized that any potential interest rate changes would continue to be data-dependent, especially since inflationary pressures remain weak. With that, any changes in economic outlook or policy bias could continue to have a strong impact on dollar movements in 2015, although the Greenback seems to be in an upward trajectory. 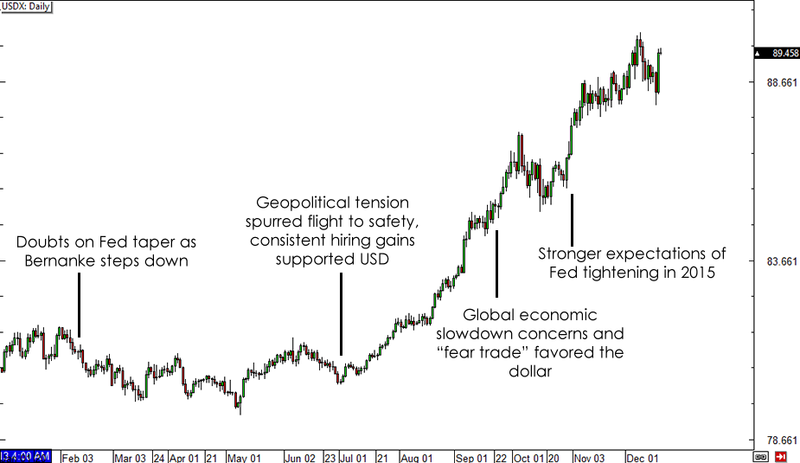 Do you think the dollar is set to repeat its strong performance next year?